The Court of King Ferdinand and Queen Isabella got its first look at the principal ingredient of chocolate when Columbus returned in triumph from America and laid before the Spanish throne a treasure trove of many strange and wonderful things. Among these were a few dark brown beans that looked like almonds and seemed most unpromising. There were cocoa beans, today's source of all our chocolate and cocoa. The King and Queen never dreamt how important cocoa beans could be, and it remained for Hernando Cortez, the great Spanish explorer, to grasp the commercial possibilities of the New World offerings. During his conquest of Mexico, Cortez found the Aztec Indians using cocoa beans in the preparation of the royal drink of the realm, "chocolatl", meaning warm liquid. In 1519, Emperor Montezuma, who reportedly drank 50 or more portions daily, served chocolatl to his Spanish guests in great golden goblets, treating it like a food for the gods. For all its regal importance, however, Montezuma's chocolatl was very bitter, and the Spaniards did not find it to their taste. To make the concoction more agreeable to Europeans, Cortez and his countrymen conceived of the idea of sweetening it with cane sugar. While they took chocolate back to Spain, the idea found favor and the drink underwent several more changes with newly discovered spices, such as cinnamon and vanilla. Ultimately, someone decided the drink would taste better if served hot. The new drink won friends, especially among the Spanish aristocracy. Spain wisely proceeded to plant cocoa in its overseas colonies, which gave birth to a very profitable business. Remarkably enough, the Spanish succeeded in keeping the art of the cocoa industry a secret from the rest of Europe for nearly a hundred years. Spanish monks, who had been consigned to process the cocoa beans, finally let the secret out. It did not take long before chocolate was acclaimed throughout Europe as a delicious, health-giving food. For a while it reigned as the drink at the fashionable Court of France. Chocolate drinking spread across the Channel to Great Britain, and in 1657 the first of many famous English Chocolate Houses appeared. The hand methods of manufacture used by small shops gave way in time to the mass production of chocolate. The transition was hastened by the advent of a perfected steam engine which mechanized the cocoa grinding process. By 1730, chocolate had dropped in price from three dollars or more per pound to within the financial reach of all. The invention of the cocoa press in 1828 reduced the prices even further and helped to improve the quality of the beverage by squeezing out part of the cocoa butter, the fat that occurs naturally in cocoa beans. From then on, drinking chocolate had more of the smooth consistency and the pleasing flavor it has today. The 19th Century marked two more revolutionary developments in the history of chocolate. In 1847, an English company introduced solid "eating chocolate" through the development of fondant chocolate, a smooth and velvety variety that has almost completely replaced the old coarse grained chocolate which formerly dominated the world market . The second development occurred in 1876 in Vevey, Switzerland, when Daniel Peter devised a way of adding milk to the chocolate, creating the product we enjoy today known as milk chocolate. In the United States of America, the production of chocolate proceeded at a faster pace than anywhere else in the world. It was in the pre-revolutionary New England -- 1765, to be exact -- that the first chocolate factory was established. 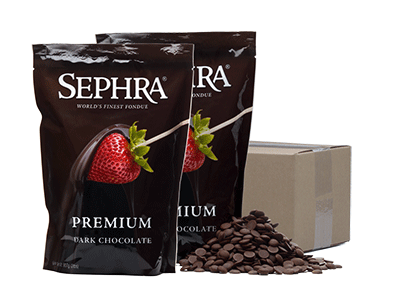 Chocolate has gained so much importance since that time that any interruption in its supply would be keenly felt. During World War II, the U.S. government recognized chocolate's role in the nourishment and group spirit of the Allied Armed Forces, so much so that it allocated valuable shipping space for the importation of cocoa beans. Many soldiers were thankful for the pocket chocolate bars which gave them the strength to carry on until more food rations could be obtained. Today, the U.S. Army D-rations include three 4-ounce chocolate bars. Chocolate has even been taken into space as part of the diet of U.S. astronauts. Cocoa beans are the product of the cacao tree. The origin of the cacao tree is in dispute. Some say it originated in the Amazon basin of Brazil; others place it in the Orinoco Valley of Venezuela, while still others contend that it is native to Central America. Wherever its first home, we know the cacao tree is strictly a tropical plant thriving only in hot, rainy climates. Thus, its cultivation is confined to the lands not more than 20 degrees north of south of the equator. A newly planted cacao seedling is often sheltered by a different type of tree. It is normal to plant food crops for shade such as banana, plantain, coconuts or coco yams. Rubber trees and forest trees are also used for shade. Once established, however, cacao trees can grow in full sunlight provided there are fertile soil conditions and intensive husbandry. Cacao plantations (trees under cultivation), and estates, usually in valleys or coastal plains, must have evenly distributed rainfall and rich, well drained soil. The fruit, which will eventually be converted into the world's chocolate and cocoa, has green or sometimes maroon colored pods on the trunk of the tree and its main branches. Shaped somewhat like an elongated melon tapered at both ends, these pods often ripen into a golden color or sometimes take on a scarlet hue with multicolored flecks. The potential age of a tree is open to speculation. There are individual trees known to be over 200 years of age, but no one has determined the real life span of the species. However, in 25 years the economic usefulness of a tree may be considered at an end, and it often becomes desirable to replant with younger trees. When thoroughly cleaned, the beans are carefully weighed and blended according to a company's particular specifications. These formulas are based on experience and desirability. In the science of chocolate making, much depends upon the ability to achieve the right formula for the desired end product through the proper selection of beans available. To bring out the characteristic chocolate aroma, the beans are roasted in large rotary cylinders. Depending upon the variety of the beans and the desired end result, the roasting lasts from 30 minutes to two hours at temperatures of 250 degrees Fahrenheit and higher. As the beans turn over and over, their moisture content drops, their color changes to a rich brown, and the characteristic aroma of chocolate becomes evident. Proper roasting is one of the keys to good flavor, but there are still several more steps to follow. After roasting, the beans are quickly cooled and their thin shells, made brittle by roasting, are removed. In most factories, this is done by a "cracker and fanner," a giant winnowing machine that passes the beans between serrated cones so they are cracked rather than crushed. In the process, a series of mechanical sieves separate the broken pieces into large and small grains while fans blow away the thin, light shell from the meat or "nibs." The nibs, which contain about 53 percent cocoa butter, are next conveyed to mills, where they are crushed between large grinding stones or heavy steel discs. The process generates enough frictional heat to liquefy the cocoa butter and form what is commercially know as chocolate liquor. The term liquor does not refer to alcohol, it simply means liquid. When the liquid is poured into molds and allowed to solidify, the resulting cakes are unsweetened or bitter chocolate. Up to this point, the manufacturing of cocoa and chocolate is identical. The process now diverges, but there is an important interconnection to be noted. The by-product of cocoa shortly becomes an essential component of chocolate. That component is the unique vegetable fat, cocoa butter, which forms about 25 percent of the weight of most chocolate bars. The chocolate liquor, destined to become a cup of cocoa, is pumped into giant hydraulic presses weighing up to 25 tons, where pressure is applied to remove the desired cocoa butter. The fat drains away through metallic screens as a yellow liquid. It is then collected for use in chocolate manufacturing. Cocoa butter has such importance for the chocolate industry that it deserves more than a passing mention. It is unique among vegetable fats because it is a solid at normal room temperature and melts at 89 to 93 degrees Fahrenheit, which is just below body temperature. Its success in resisting oxidation and rancidity makes it very practical. Under normal storage conditions, cocoa butter can be kept for years without spoiling. The pressed cake that is left after the removal of cocoa butter can be cooled, pulverized and sifted into cocoa powder. Cocoa that is packaged for sale to grocery stores or put into bulk for use as a flavor by dairies, bakeries, and confectionery manufacturers, may have 10 percent or more cocoa butter content. "Breakfast cocoa," a less common type, must contain at least 22 percent cocoa butter. In the so-called "Dutch" process, the manufacturer treats the cocoa with an alkali to develop a slightly different flavor and give the cocoa a darker appearance characteristic of the Dutch type. The alkali acts as a processing agent rather than as a flavor ingredient. While cocoa is made by removing some of the cocoa butter, eating chocolate is made by adding it. 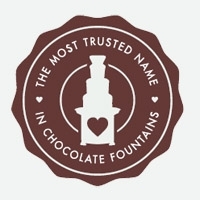 This holds true of all eating chocolate, whether it is dark, bittersweet, or milk chocolate. Besides enhancing the flavor, the added cocoa butter serves to make the chocolate more fluid. One example of eating chocolate is sweet chocolate, a combination of unsweetened chocolate, sugar, cocoa butter and perhaps a little vanilla. Making it entails melting and combining the ingredients in a large mixing machine until the mass has the consistency of dough. Milk chocolate, the most common form of eating chocolate, goes through essentially the same mixing process-except that it involves using less unsweetened chocolate and adding milk. Whatever ingredients are used, the mixture then travels through a series of heavy rollers set one atop the other. Under the grinding that takes place here, the mixture is refined to a smooth paste ready for "conching." Conching is a flavor development process which puts the chocolate through a "kneading" action and takes its name from the shell-like shape of the containers originally employed. The "conches," as the machines are called, are equipped with heavy rollers that plow back and forth through the chocolate mass anywhere from a few hours to several days. Under regulated speeds, these rollers can produce different degrees of agitation and aeration in developing and modifying the chocolate flavors. 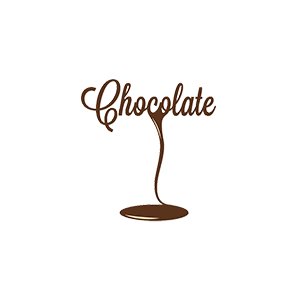 For convenience, chocolate is frequently shipped in a liquid state when intended for use by other food manufacturers. Whether solid or liquid, it provides candy, cookie, and ice cream manufacturers with the most popular flavor for their products. Additionally, a portion of the United State's total chocolate output goes into coatings, powders and flavorings that add zest to our foods in a thousand different ways. Besides the equipment already described, the industry employs a number of fascinating machines to do the work of shaping and packaging chocolate into the familiar forms that we see every day on store counters. Some of the shaping machines perform at amazing speeds, squirting out jets of chocolate that solidify into special shapes at a rate of several hundred a minute. *Other machines do a complete job of wrapping and packaging at speeds that human hands would find impossible. * Separate from the chocolate industry but of interest nonetheless, is the enrober-a machine employed by many candy manufactures in the creation of assorted chocolates. The enrober receives lines of assorted centers (nuts, nougats, fruit or whatever desired filling) and showers them with a waterfall of liquid chocolate. This generally covers and surrounds each center with a blanket of chocolate. Yet other confectionery machines create a hallow-molded shell of chocolate which is then filled with a soft or liquid center before the bottom is sealed with chocolate. The mechanized nature of the entire chocolate-making process contributes greatly to the industry's high standards of hygiene and sanitation. To keep check on these standards, chocolate factories constantly run quality tests, which show whether the process is proceeding within the strict limitations designed for each product. These tests cover an amazing range-there are tests for the viscosity of chocolate, for the cocoa butter content, for acidity, for the fineness of a product and, of course, tests for purity and taste of the desired finished product. All chocolate manufacturers, it is important to note, must meet the standards as set forth in the rules and regulations of The Food and Drug Administration. These govern manufacturing formulas, even to the extent of specifying the minimum content of the chocolate liquor and milk used. They also impose strict rules regarding the flavorings and other ingredients that may be used. Where methods of manufacturing are concerned; however, manufacturers have a completely free hand and have developed individual variations from the "pattern." Each manufacturer seeks to protect their own methods by conducting certain operations under an atmosphere of secrecy. Modern technology, in this respect, is reminiscent of the day of the Spanish monopoly. Today's "secrets," unlike those of old, include many small but important details which center on key manufacturing operations. No chef guards his favorite recipes more zealously than the chocolate manufacturer guards his formulas for blending beans or the time intervals he gives to his conching. Time intervals, temperatures and proportions of ingredients are three critical factors that no company wants to divulge. A visit to a chocolate factory certainly will not reveal any secrets; however, the visitor will be impressed by the gleaming appearance that such a place has. Chocolate manufacturers conduct all operations under sanitary, laboratory-like conditions in keeping with the purity of the products they make. They follow a daily regimen of machine maintenance and general housekeeping that is not exceeded in the food industry. Cleanliness is, indeed, the universal byword of the chocolate industry. Chocolate factories not only have careful programs for industrial sanitation and for the personal hygiene of their employees, but they are continually striving to improve their programs. Technicians use laboratories to analyze every phase of chocolate preparation-from raw materials to finished products. They test samples for the market as well as experimental products produced in a company's pilot plants. These pilot plants consist of miniature equipment which duplicates a company's entire chocolate making process and those of some of their customers, as well as providing sample quantities of any product desired. Chocolate manufacturers are making increasing use of pilot plants in conjunction with their laboratory research programs to develop interesting new products and find new ways of making the old ones.